TBILISI, DFWatch – Four different videos showing physical and sexual abuse of prisoners in Georgian prisons has triggered a widespread public outrage and a demand for the prison minister to step down. The videos were released on Tuesday by the Ministry of Internal Affairs, and two opposition leaning channels TV Maestro and TV 9. Tuesday night, thousands of people gathered spontaneously at two spots in the capital to show their disgust at the images of humiliating sexual abuse in Georgian prisons. Early evening after the release of the videos, thousands of people rushed to the large prison at Gldani, where the abuse videos were filmed, some of whom had family members on the inside. Others gathered outside the philarmonic concert hall in the centre of Tbilisi, where President Mikheil Saakashvili was inside attending a concert. 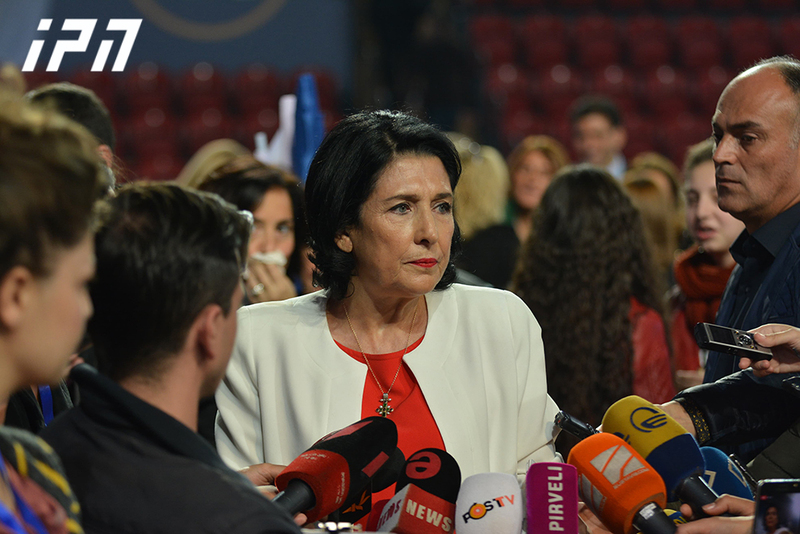 Khatuna Kalmakhelidze, Minister of Corrections and Legal Assistance, announced her decision to leave office. The minister this morning asked the prime minister to accept her resignation. But in Georgian media there are calls for not Kalmakhelidze, but Minister of Internal Affairs Bacho Akhalaia, to be held to account as the one really responsible. 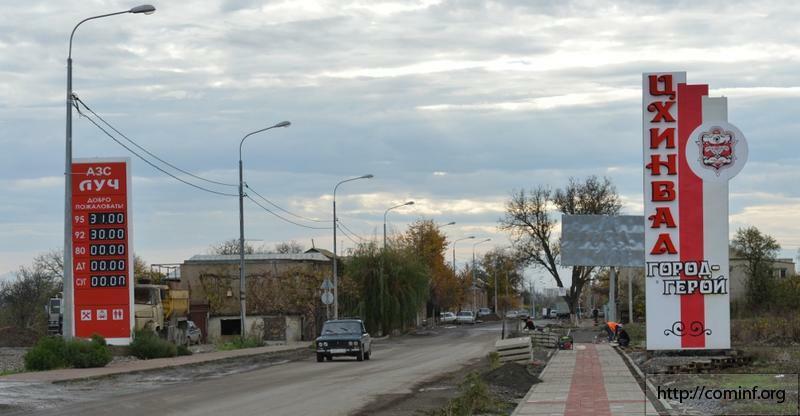 Akhalaia only a few months ago became minister, and before that was head of the domestic intelligence police, Kudi. He is part of a powerful clan of Saakashvili loyalists based in the west of Georgia. His brother Data is the current defense minister. Saakashvili in a statement joined the chorus of outrage at what is seen, and said those responsible should be punished. But the government claimed that the abuse videos are staged by the opposition in order to discredit the government on the eve of an important parliamentary election. The interior ministry claims the allegedly ficticous abuse was organized by Tamaz Tamazashvili, an inmate of the same prison, and that he ordered the staging and filming of what is seen in the clips. Tamazashvili is a member of Bidzina Ivanishvilis’s Georgian Dream coalition. He was convicted last year of illegal possession of arms, but claims he was set up. The opposition regard him as a political prisoner. He was arrested shortly after Georgian Dream leader Bidzina Ivanishvili went into politics in October 2011. 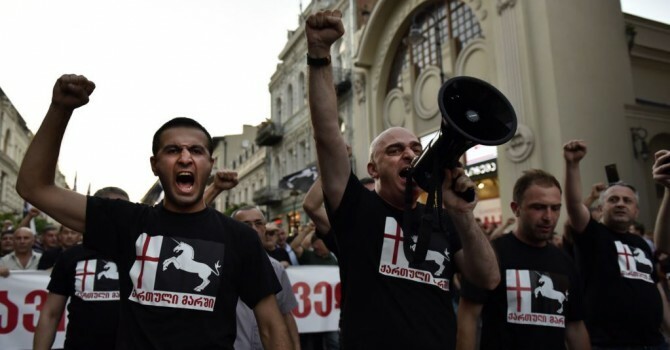 A son of Tamazashvili says police placed a weapon on him before arresting him. The interior ministry released footage from one of the cells in Prison No 8 in Gldani, which showed several guards physical abusing two prisoners. 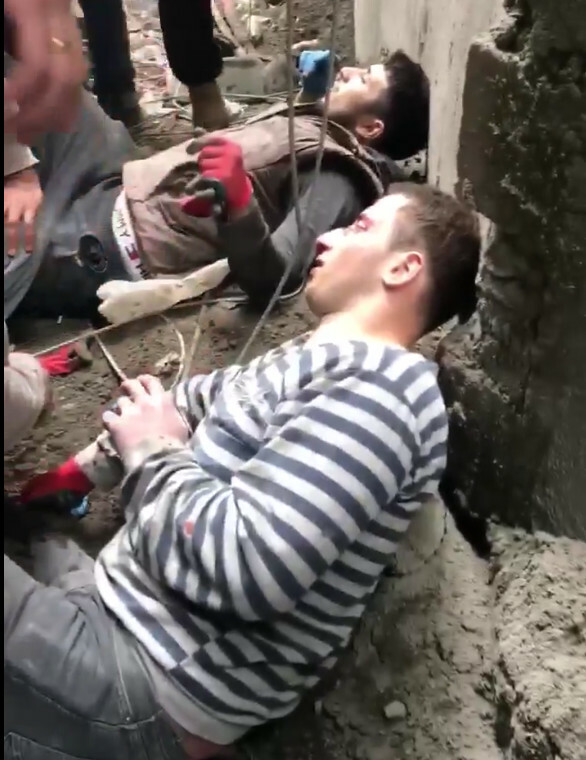 Explaining that the footage was shot by Levan Purtskhvanidze, the head of security section in the prison, Vladimer Bedukadze, an operative duty inspector and several individuals under their influence were instructed to record the torture. Meanwhile, the opposition affiliated TV 9 released another abuse video which shows sexual abuse of prisoners reminiscent of what came out of Abu Ghraib prison in Iraq in 2004. One of the videos shows a man wearing a kind of helmet, with his hands handcuffed behind his back and attached to the cell bars, while he is being sodomized with the shaft of a broom. Another clip shows a man being sodomized with what appears to be a cigarette, after which he is ordered to smoke it. Vladimer Bedukadze, who was yesterday reported wanted by the Interior Ministry, has sent the footage aired on TV9 to Brussels. In an interview with the TV station he stated that Bacho Akhalaia, the current interior minister, who used to be prison minister, is the one, who instructed and gave orders to torture prisoners. Earlier, Maestro TV aired clip http://www.youtube.com/watch?v=SB1-5qprsmQ which shows more than ten prison employees beating prisoners. Khatuna Kalmakhelidze, the secretive prison minister who for all her tenure has denied the media access to her prisons except for a few tightly controlled tours, Tuesday made a short statement on pro-government TV Rustavi 2 that her ministry’s only priority is to capture those who did this and punish them. Wednesday morning, she announced her resignation. Kalmakhelidze Tuesday fired Davit Chakua, head of the corrections department. 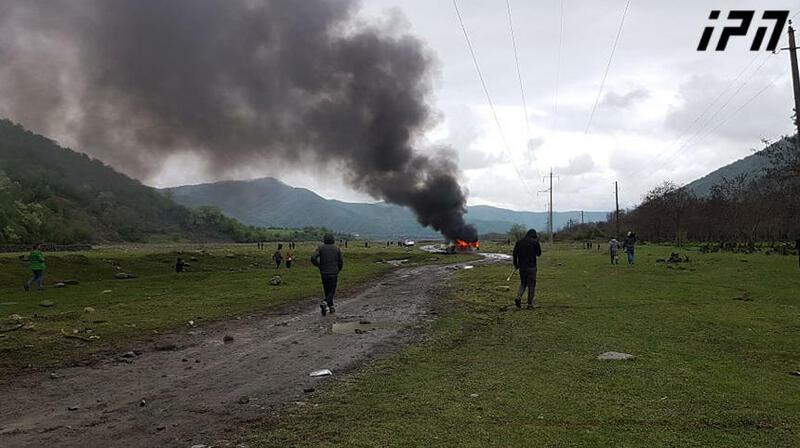 The minister told Rustavi 2 TV that several persons who are seen in the footage have now been arrested, while others are being searched for. Public Defender Public Defender asks the Chief Prosecutor to immediately investigate the case and identify all who participated in these incidents and punish them. According to Tughushi, he visually recognized several high ranking officials of penitentiary in the videos. Tughushi said that Gldani Prison in the north of the capital has always been a place where prisoners were mistreated and there have been many incidents; however they were always ignored by official bodies. Torture of prisoners is widespread in Georgia. The ombudsman’s latest annual report dedicated 300 pages to describe horrible stories of physical, verbal and sexual abuse of prisoners and the terrible conditions they have to live in, not only in Gldani prison, but many other prisons all over the country. Georgia’s prison sector is a permanent source of concern for both local and international human rights organizations. Yesterday’s events led to a spontaneous protest in the capital. Crowds gathered near Prison No 8 at Gldani, and another protest started late night near Tbilisi Concert Hall, where President Saakashvili was attending a concert. They demanded the resignation of the prison minister, the interior minister and officials of the ministry. Participants of the rally blocked the street shouting ‘don’t torture’. They also demand for international organizations to be let into prisons. Georgian authorities have consistently denied all journalsts — domestic and foreign — access to its prisons, except for a few media tours. Prison minister Khatuna Kalmakhelidze has never held a press conference in the usual sense of the word, and almost never gave interviews. Her only means of communication to citizens were a few speeches in parliament, and brief comments to media as she rushed into government sessions, usually consisting of hasty explanations for why she refused to talk about some instance of torture. In stark contrast to her hostile behavior towards journalists who have tried to raise the issue of torture with her, on the three state controlled TV stations, Kalmakhelidze appeared on chat shows in a movie star like manner, and in excessively friendly human interest reports showing her career and ascent to position as minister, as well as achievements in the post, such as building a prison facility for female inmates with small children. A series of rallies are planned to be held today in capital and other large cities of the country. Mid day Wednesday, people were gathered in front of the Philharmonic. Georgian Dream representatives suspect that Tamaz Tamazashvili is in danger of serious harassment in Gldani Prison. Representatives of the Public Defender yesterday visited him in prison and reported that there is no harassment against Tamazashvili, who only learnt about the accusations the government has leveled against him by listening to the radio. President Saakashvili, who the same evening attended an event in Tbilisi Concert Hall, yesterday night made a statement saying that after seeing the footage he is very angry and shocked. He said all those involved in the abuse deserve the strongest form of punishment. He said everyone who was responsible not to let such facts happen will be fired and the ones who committed the crimes will spend many years in prison.